Today I have the honor of introducing you to one of the artists who has most inspired me. When I first learned of Etsy and began considering selling my scarves there I fell in love with her shop and her silk art. She is a true artist, and her paintings always amaze me with their exquisiteness. Hope you enjoy getting to know her through this interview as much as I have. Your story about how you began painting silk and what you do in this field now, etc. We live out in the country on a lake where I have the trees, flowers, birds and all of nature around to inspire me, and the peace and quiet to let me focus and create. My favorite was probably one I did on silk satin that featured three large jungle cat heads: a tiger, leopard and puma. I normally paint florals so this was quite a stretch and it turned out beautifully. It was hard to part with that one when it sold. I’d have to say my signature design is large florals painted in a loose watercolor style where I let the dyes run and blend without resist. 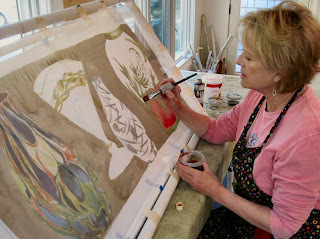 I’ve developed my own method of silk painting simply thru trial and error…much of it similar to watercolor technique. I tried resist but quickly realized I wasn’t an “inside the lines” type personality. I use thickened dye where I want control or a hard edge, otherwise I like to let the dye run and blend on the silk. I prefer to paint on chiffon. I use Jacquard Red Label dyes from Dharma and a few Tinfix colors as well. I would encourage silk painters to check out the SPIN (Silk Painters International) Facebook page. You needn’t be a member of SPIN although I recommend that as well. SPIN is a worldwide association of silk painters of all levels. The Facebook page is a wonderful community for sharing all aspects of silk painting…..tips, ideas, material sources….it’s a terrific, supportive community of talented artists. Right now, I’m working on a parrot tulip wrap for my dear friend Karen Sistek who was chosen as the signature artist for a prestigious tulip festival. 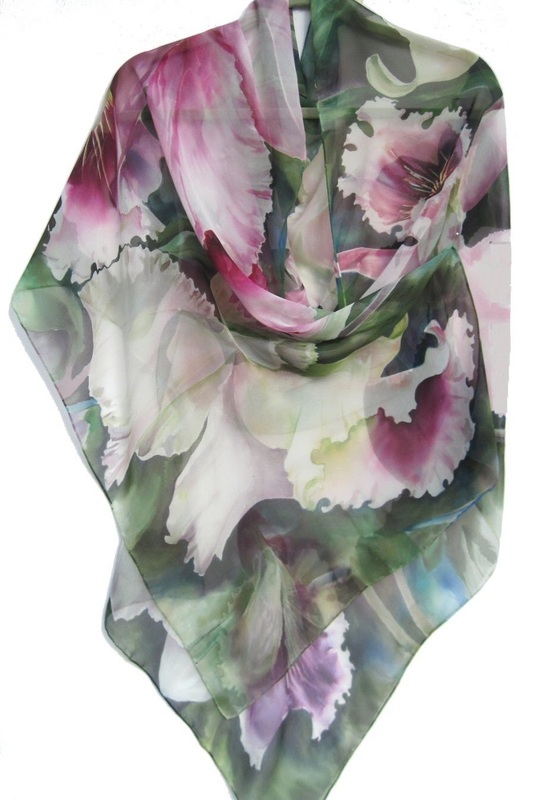 Karen requested a tulip themed silk to wear for the festival. What advice can you give us on selling our silk art? I started my Etsy shop, Silk Siren, about four years ago and it’s been a wonderful venue for me. I don’t do shows, or blog or market my silks anywhere else. I’ve been fortunate to have my silks “discovered” quickly and I have a loyal following of clients who return again and again. The fact that Etsy is a global marketplace has given me the exposure resulting in shipping my silks to a worldwide clientele. 1. Do your research and find a niche. You must have a unique product. 2. Offer a professional product for good value. 4. Connect to your buyer with great photos and inviting descriptions. Great story, great silk artist! For me Lynn is also the guide to Etsy! I met her in a silk painters group (NING Network leaded by Francine) and her stories about her Etsy shop and her good tips gave me the courage to open an Etsy shop too! Thank you, Lynn!